Poland has the fastest-growing economy in the European Union and the power that drives it comes from the dirtiest of fossil fuels, coal. How can the country cut its dependence on this polluting source of energy? Coal produces around 93% of Poland's electricity and the industry employs more than 100,000 people. It's a cheap way to produce energy but it provides an enormous headache for any government trying to maintain economic growth and also meet ever-stricter EU greenhouse gas emission targets. Much of that power - around one-fifth of the country's electricity - is produced from just one plant, Elektrownia Belchatow, in central Poland. It is Europe's largest thermal power plant and its biggest polluter, emitting the equivalent of close to 39 million tonnes of CO2 last year, a rise of 31% from 2010 thanks to the commissioning of a new unit in September. It burns lignite, also known as brown coal, the cheapest fossil fuel, which produces energy at half the cost of hard coal and a quarter the cost of natural gas. The open cast mines that fuel the plant are so large they could accommodate small towns. The bucket wheel excavators that dig out the lignite are the height of 30-storey tower blocks. The company which owns the plant, Polska Grupa Energetyczna (PGE), believes, despite the high CO2 emissions, it will be cost-effective for another 30 years. But PGE knows it has to reduce its dependence on coal if it is to remain profitable. The company plans to invest up to $104bn (£64bn) from 2012 to 2035 to create a diversified power generation structure. It wants to reduce the use of coal and lignite in its plants from 94% now to 38% by 2035. That should reduce the amount of CO2 the company's plants emit from 1.08 tonnes per megawatt hour (MWh) to 0.27 tonnes/MWh. Coal would be replaced with nuclear power, natural gas and renewable energy sources. "We're not getting into gas and nuclear power plants because we suddenly fell in love with this technology, it's precisely in order to reduce the company's emissions," PGE's then chief executive, Tomasz Zadroga, said last year. "We have to change the fuel mix of the company because otherwise CO2 will finish us," he added. 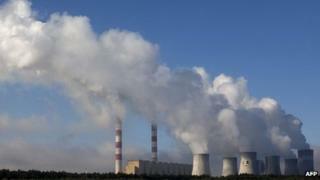 Poland signed up to the EU's target to reduce greenhouse gas emissions by 20% from 1990 levels by 2020. However it has blocked a proposal to increase that cut to 25% by the same date, saying it would cost the country about $1.45bn (£900m). It has also agreed the EU's longer-term target of reducing emissions by 80-95% by 2050, but in March Poland vetoed proposals setting out milestones to achieve that goal on the grounds they would harm its economy. Image caption Giant extractors claw brown coal from a Polish mine - but for how much longer? The Polish Chamber of Commerce has estimated that implementing the 2050 road map would triple or quadruple energy prices after 2020 and cause the country's GDP to fall between 5%-11% per year by 2030. "For countries like Poland such a reduction (in emissions), with our starting point today of basing 93-95% of our electricity from coal, would mean, firstly, extremely high prices for electricity in 2050, and secondly, the transfer of industry outside Poland's borders. This is not acceptable because we are and want to remain an industrial country. Our main strength today is that we are part of industrial Europe and this is part of Poland's success," Marcin Korolec, the Polish environment minister, tells the BBC. Mr Korolec says the government aims to reduce the power sector's dependence on coal by increasing energy efficiency, introducing nuclear power and boosting natural gas and renewable energy, but fossil fuels will remain in "the predictable future". Poland's future use of coal is determined largely by the EU's Emissions Trading Scheme (ETS), one of the key policies introduced by the 27-member bloc to reduce greenhouse gas emissions. In the third phase of the cap-and-trade scheme, which starts next year, Polish power plants will have to start buying some allowances to allow them to emit CO2 at auction - instead of receiving all of them for free as they do now - making coal less competitive. The environment ministry has drafted a policy paper on the future of the ETS which would mean Polish industry would continue to receive free emission allowances. In order for a plant to receive free emission allowances from 2013 they will have to meet a greenhouse gas performance benchmark. Poland wants this benchmarking system to apply to the power sector and be based on the fuel a plant uses rather than a product-based system. Such a system would recognize that countries have different starting points - Poland's energy mix has a heavy carbon footprint - and therefore be fairer, the government says. A scheme like this would create certainty for utilities planning to build new, more efficient and therefore less polluting coal-fired plants and spur the development of cleaner coal technologies such as capturing CO2 and storing it underground. It would also protect sensitive customers from electricity price increases and limit carbon leakage, where industrial plants relocate outside the EU to escape the ETS. Poland is also proposing inviting the EU's eastern and southern neighbours to connect their systems to the ETS to further reduce the risk of carbon leakage. However, Poland's Climate Coalition, which includes groups like Greenpeace and WWF, says that de-carbonizing the Polish economy would not be so expensive. It says the Polish Chamber of Commerce report was sponsored by heavy industry and did not take into account the health benefits from cutting coal pollution, ceasing coal subsidies and imports, nor the economic boost provided by investment in renewable energy sources. They commissioned a rival report that estimated the cost of reducing greenhouse gas emissions by 47% by 2030 at no more than 1%-2% of GDP if the climate policy was financed properly. "Poland can no longer bury its head in the sand and pretend that further reductions are not necessary or possible. In fact investments in the renewable energy sector can boost the Polish economy and create thousands of new and lasting workplaces," Maciej Muskat, director of Greenpeace Poland, tells the BBC. "Clinging to coal will generate more costs with every coming year - in the form of subsidies given to the industry. Some business experts and trade unionists in Poland are starting to realise that burning coal is a lose-lose game - but this process is way too slow."